We value you as a member here at The Jones Center. We’re expanding our memberships to give you greater customization. We now have a menu pricing model, so you can choose how you want to use the Center. We’re also expanding our fitness classes to give you even more premier options for group fitness. Our goal is to be a world-class facility. This means offering world-class amenities and services. We opened a state-of-the-art fitness center in June 2017 and did not raise any rates. Since then, we’ve continued to add more classes, and we’re adding even more premier fitness options starting in June 2018. Since we implemented memberships in 2012, we have not raised the rates for all-access members. This rate change helps us maintain sustainability so that we can continue to operate for the next 20+ years. When will the new prices go into effect? The new prices will go into effect on July 2, 2018. I’m already a member. When will my current membership rate change? If you are currently paying monthly, your current membership at your current rate will automatically switch over to the new pricing on July 15. Core members (previously known as “Fitness”) will continue to have access to fitness classes until 1 year after their start date. At that point, you can add fitness classes to your membership package. If you originally paid for the one year up front, your new rate will not change until you renew after the one year from your start date. I love your fitness classes. Why will they cost extra now? Four years ago, we included our fitness classes into the membership. Since then, we’ve greatly expanded our fitness class offerings and have brought on top-notch instructors and staff members to run them. This brings a significant cost to our budget. Separating classes from the Core membership allows people to pay for what they use giving us a more sustainable future in our fitness center. This also will allow us to offer premier fitness offerings like barre, hot yoga, small-group fitness, and more. 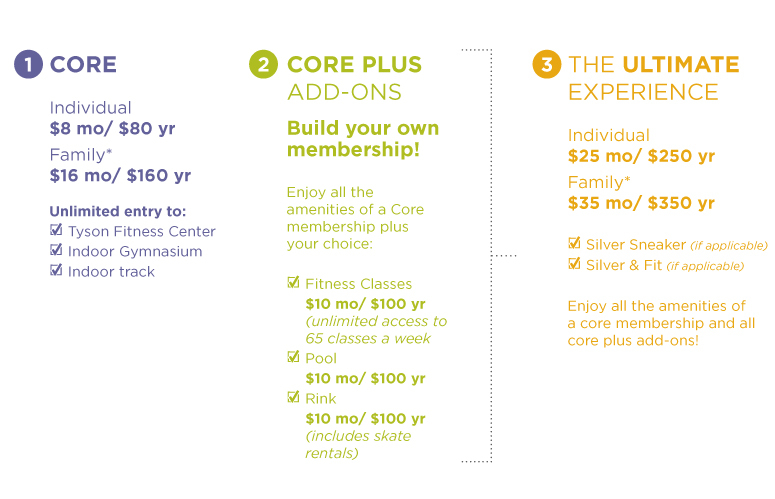 What do memberships cost at other facilities in Northwest Arkansas? The Jones Center operates at below market-value to give a world-class experience that’s accessible to all people. The average cost of a membership in NWA is 3x ours. A fitness class at other facilities is often 3x our rate. The value members get at The Jones Center is unmatched in our region. Will my membership still be a 1-year commitment? No- you’ll no longer be required to sign a 1-year commitment. Can I upgrade or downgrade my membership at any time? Yes! You can upgrade or downgrade your membership at any time throughout the year. We understand that life happens: moving to a new city, injury, etc. so we’re revamping our membership to give you the flexibility to cancel and rejoin at any time. You’ll just need to sign a quick and easy cancellation form by the 10th of the month. *Please note that if you pay for that month and cancel, your membership will be cancelled, but you will not be refunded for the rest of that month. Do I have the option to pay monthly or in full? You can do either one! You can pay month-to-month, or pay in full for a year to receive a discount equivalent to 2-months free. Will there be any new benefits to my membership? Absolutely! We’re adding new premier fitness class offerings with top-notch instructors like barre, small group fitness, and more hot yoga sessions. Memberships now have no long-term agreement, and members now receive a 20% discount on reservations, birthday parties, and activities. All members still have access to the fitness center, gymnasium, indoor track, locker rooms/showers, and free wi-fi. Will there be childcare now? Not yet. We’re continuing to work on a viable, sustainable model for affordable childcare in our facility. We’ll update you as we make progress on childcare. I can’t afford the membership prices. What can I do? The Jones Center has a scholarship program funded by the Walmart Foundation that gives access to people who could not otherwise afford a membership. You can apply for a scholarship at the fitness center desk. Do you offer discounts for certain professions? Yes! We offer a 10% discount to seniors (65+), all Springdale Schools employees, all first-responders, servicemen and servicewomen (current and retired). Do you offer a Corporate Wellness program to local companies and business? We do! We understand that once health management becomes a business priority, it can create healthier, happier, and more productive employees, while increasing the company’s bottom line. Those who participate receive a discount on memberships and company team building activities. Visit our Corporate Wellness page to learn more. Still have more questions? Contact our Membership Coordinator, Caroline Franco, at cfranco@jonesnet.org or 479-756-8090 ext. 2142, or call our fitness desk at ext. 2127.